ladydualwieldin had the most liked content! I dream of the day we get more merchandise for characters other than these four. lol thank you. It was also in BBS and Re:Coded as well. Don't get me wrong, I was so excited and delighted to actually see it said so directly in that last trailer, but yeah, so many people acted like it was a new thing. Which Kingdom Hearts character would be a fun dad? Which Kingdom Hearts character is most likely to win an Oscar? thanks! ^^ thank you! and I haven't tried him yet, but I have plans for him! As well as the Foreteller hoods, because I just love animal ears. Been a while since I posted here! And now I (briefly) return with a side project I just finished, a scoodie (scarf + hoodie) based on Kairi's KH3 outfit! Or, you know. I like to believe that artwork was indeed her KH3 outfit. EITHER WAY, I thought it was adorable and I wanted to own it, so yeeee I will now be cozy all winter! (And if KH3 drops during the cold season, one day, you can bet I'll be wearing this as I wait outside the store at the crack of dawn, lol.) I'm also selling them in my shop here if anyone's interested! we can only see the left side of his jacket here, which is black, as it is in canon. The sleeve and bottom have white trim, as they do in canon, and you can see his vest at the bottom and what looks like his black undershirt on his chest. it's most definitely Ven, lol. almost 15 years into this series and people still can't distinguish Ven from Roxas. y'all need to step it up! Well, you can't call them out too much because he has a new hair cut, his armor plate is gone, the other side of his clothes isn't white, and the image is smaller. Ven is Roxas. Pls, it's obvious, they're certainly not twins. this. 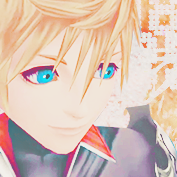 And his clothes are very obviously Ven's, not Roxas', and contrary to the post's claim it is NOT a new outfit. he's missing his chest strap, master symbol, and spaulder, but that's definitely his jacket. Yeah, my party usually splits into teams of 3 or 4 now to cover multiple bosses. It just takes a lot longer for every person you lack, of course. ...See, THIS is a real raid boss. Difficult in general and impossible without a team. CHALLENGE ACCEPTED. Six people can take it down in about 15 minutes. Beating one boss lets you clear about 80% of one avatar board, so it's not that bad. I get about 60k lux per boss, assuming I take out his weakspots only twice, so the lux payout during double hour will be insane.